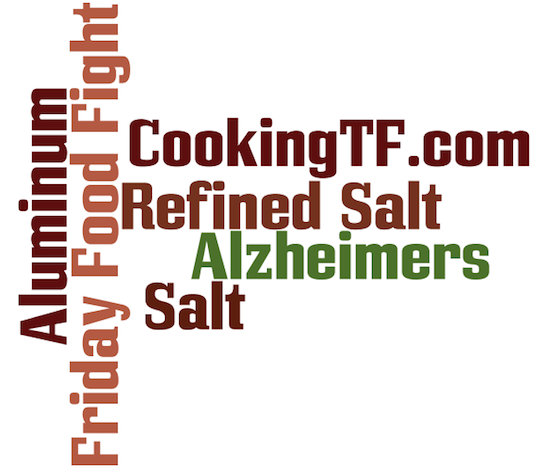 Friday Food Fight: There’s WHAT in my Salt?!?!?! You are here: Home / Food Matters / Friday Food Fight / Friday Food Fight: There’s WHAT in my Salt?!?!?! It’s Friday, so its time for another food fight! Every Friday we look at an ingredient, a decision or a process within the real foods sphere. It might be as simple as why you should choose sea salt over iodized salt. It might be more complex, such as what soaking is, how to soak and why you’d want to do it. Grass-fed vs grain-fed. Pastured vs cage-free eggs. What if I can’t afford the best, what’s the next best alternative? All of those decisions that are out in the real food world that are enough to make your head swirl. We’ll take it one bite at a time. Information is always easier to digest when it’s in small pieces. We’ll start with the easier and move to the complex. As always, we will do so in a good, better, best format, with an eye on the budget. Some weeks, it will be a blog post, other weeks a video. We interrupt our regularly scheduled discussion on sugar. Gotta go back to the salt for a post. For all my my anti-iodized salt posts, I do keep it around the house. Particularly, I use it for cleaning, crafts and things like that. I just never eat it. If you’d like to hear more about what I use it for, listen to our podcast #26 on basic changes for real food beginners. This week, we went by the store and I picked up a pound of salt for 39 cents. My daughter had dropped a dozen eggs on the kitchen floor this weekend, and I used the last of my cheap, iodized salt in cleaning that up. Refined salts are perfect for cleaning up spilled egg. It absorbs the goo and turns into a gel that is far easier to get off of the floor instead of feeling like you’re just smearing egg white everywhere in an ever-enlarging puddle of glop. What the WHAT? 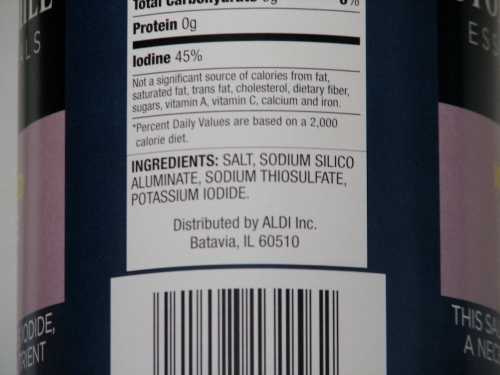 WHY is Aluminum in SALT?!?!!? The FDA, of course, regards it as safe. Sodium silicoaluminate is an anti-caking agent. So my question is, how much aluminum is present and how bio-available is it? Bioavailable means that your body can absorb it. So I went digging in the scientific studies to see if I could find any information. I did find one study that showed it was bioavailable, but because I couldn’t yet get a copy of the full text, I can’t tell to what extent. Of course, this chemical is an acid salt, meaning that it will release more aluminum when exposed to acids, which is what you would find in certain foods like baked goods where acid is used in part to cause the food to rise. Baking powder is an acid, for example, as is buttermilk, lemon juice, vinegar and many other foods. Or anything with a sauce is going to be acid, pretty much. It can be up to 2% of a table salt according to the Be Food Smart Database. They rate the ingredient as a “D,” stating that it is controversial and best avoided. The A-Z Guide to Food Additives rates it as an “F” and connects it with Alzheimer’s Disease. In my book, *any* bioavailable aluminum is too much aluminum. I watched my beloved great-grandmother suffer and wither away from Alzheimer’s when I was in my 20s. She told horrid stories of watching her own dad waste away and die of the same thing, they just didn’t have a name for it back them. I don’t care to see me or my kids go down that same path. So, this is just yet another reason to avoid refined salts. This salt will return to the store and I will try to find a cheap salt for crafts and cleaning that doesn’t have aluminum in it. If I’m successful in finding one on my shopping trip this weekend, I’ll share. Friday Food Fight: Is Organic Important for Maple Syrup? This is terrifying! Thanks for the post – I rarely use salt in my own cooking, unless a dash is absolutely necessary for the flavor. And I’ve cut out processed foods (and thus salt) in my diet. But even a little is too much! So thankful I switched to redmond’s real salt, but I do want something safe for making playdough and the like. I will need to check names when I go look for some this week. This particular salt did not have dextrose, but I have seen others that do include dextrose (along with that aluminum stuff and the silicone dioxide). And the dextrose is most likely made with GMO corn. So there’s another reason to avoid the stuff!